The Six then had their sentences commuted to life in prison by a Libyan government panel. They were released following a deal reached with European Union representatives on humanitarian issues (the EU did not condone the guilty verdict in Libya against the Six). 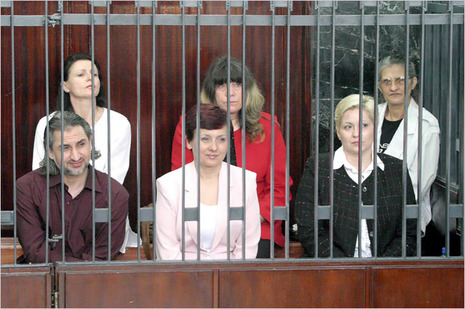 On July 24, 2007, the five medics and the doctor were extradited to Bulgaria, where their sentences were commuted by the Bulgarian President and they were freed. Libya has since complained about the releases (although, as of July 31, not to the EU), and the issue remains ongoing. Furthermore, a controversy has arisen concerning the terms of release, which allegedly include an arms trade as well as a civilian nuclear cooperation agreement signed by French President Nicolas Sarkozy in July 2007. Both the French president and the Bulgarian president have denied that the two deals were related to the liberation of the Six, although this has been alleged by a variety of sources, including Saif al-Islam Gaddafi, the son of the leader of Libya. After more than eight years in jail in Libya, five Bulgarian nurses and a Palestinian doctor stepped off the French presidential plane here in Bulgaria’s capital early this morning where they were greeted by crying relatives and Bulgaria’s top officials. They were accompanied by the European Union’s foreign affairs commissioner, Benita Ferrero-Waldner, and the wife of France’s president, Cécilia Sarkozy, who had helped secure their release and had flown with the medical workers from Libya. In a press conference at the airport terminal, standing in front of the nurses, Bulgarian foreign minister, Ivailo Kalfin, said that the Bulgarian president, Georgi Parvanov, had pardoned the medical workers, thus ending all their legal liabilities, to the emotional applause of the waiting crowd. On July 24, 2007, five Bulgarian nurses and a Palestinian doctor who were imprisoned in Libya for eight years on charges of deliberately infecting more than 400 children with HIV were freed in Bulgaria. The six were arrested in 1999 after a massive outbreak of nosocomial HIV infection was discovered at Al-Fateh Hospital in the city of Benghazi. Confessions were extracted from them under torture, which they later recanted. Their first trial, in 2004, resulted in guilty verdicts and they were sentenced to death before a firing squad; the verdict was overturned by the Libyan Supreme Court and a new trial was ordered. Evidence presented by world-renowned HIV/AIDS expert Luc Montagnier and Italian virologist Vittorio Colizzi refuted the charges against the healthcare workers and indicated the infections were most likely due to improper and unsafe infection control and injection practices, but this evidence was thrown out of court by the Libyan prosecution, leaving the six all but defenseless.